I was in the mood for something sparkly but still understated. 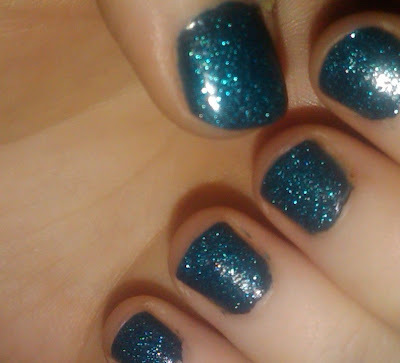 I went with one of my favorite polishes, OPI's Ski Teal We Drop and chose a glittery top coat in LA Colors Color Craze in Aqua Crystals. From a distance, the look is somewhat reserved, but in the light, the flecks of glitter really pick up. This picture doesn't do the colors justice. I was really happy with the outcome and will probably wear it again in the winter! Now Watching: Sunday Night Football - GO STEELERS! Debauchery In the Desert Tour! Luxe Living: ERIN FETHERSTON'S NEW YORK APT.